Product prices and availability are accurate as of 2019-04-06 12:48:21 EDT and are subject to change. Any price and availability information displayed on http://www.amazon.com/ at the time of purchase will apply to the purchase of this product. Early and cool weather tolerant. Smooth, round to oval-round fruits are very sweet, flavorful, and slow to crack even in cool, cloudy weather. The 3-3 1/2 lb. 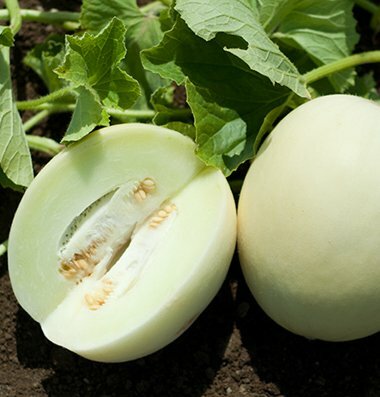 melons hold well on the vine or after being harvested. Smooth, round to oval-round fruits are very sweet, flavorful, and slow to crack even in cool, cloudy weather. Plants are strong and vigorous and perform well in warm or cool weather. Since melons like consistently warm conditions, plastic mulch and row covers will make for earlier crops and better yields, especially in the North. Remove covers when plants have female flowers (tiny fruit at base of blossom). Each packet includes 35+ seeds and planting instructions. Even hardened melon seedlings are tender. Do not disturb roots when transplanting, and water thoroughly.